Vote Now - Should the US Attack Iran's nuclear and military infrastructure? As the US military build up continues to gain momentum in the Persian Gulf, which includes some 50 warships comprising of 2 aircraft carrier battle groups. These military assets are reinforced by well established military bases in neighbouring countries, with hundreds of war planes to enable around the clock bombing capability. Any attack against Iran would firstly be targeted at Iranian air bases and command and control structures as well as naval ports so as to limit the immediate retaliatory response, before around the clock bombing of the well dug in Iranian Nuclear facilities would take place. We ask the question should the US attack Iran's nuclear & military infrastructure ? Nuclear weapons in the hands of an Islamic fundamentalist regime in Iran that holds apocalyptic visions of martyrdom in the name of God, poses a far greater risk to the world then the consequences of the expected retaliatory action following a US attack on Iran. The US perceives Iranian interference in Iraq as one of the key reasons for the ongoing instability, as Iran attempts to increase its dominance over the region, and importantly significant crude oil reserves that the US is seeking to secure as US oil reserves dry up. .Therefore an attack that succeeds in destroying Iran's nuclear infrastructure would have the effect of diminishing Iranian influence in the region and help to stabalise Iraq enabling Iraqi oil to flow more freely. Iran is continuing to violate US resolutions calling on it to suspend Uranium enrichment. Attacking Iran's nuclear infrastructure would require a massive aerial campaign and given that much of the infrastructure is widespread and well dug in numbering some 1500 targets, it is not wholly certain that the objective of destroying the infrastructure can be achieved. An attack would reinforce Iran 's resolve that the only deterrence against attack would be for Iran to double its efforts to secure a nuclear deterrence regardless of the consequences. Iran is still many years away from developing a nuclear weapon, therefore proper and serious diplomatic negotiations should be entered into which should include security guarantees against any attack against Iran by the US or Israel in exchange for Iran abandoning its nuclear programme. To date the Bush Administration has shown itself as totally inept in negotiating anything of substance with anyone let alone the Iranians. Iran's retaliatory response is expected to widen the war in the middle east, the conflagration will not only further destablise Iraq and Afghanistan but also aim to bring Israel into another war with Lebanon, and probably make the Gulf of Harmuz unusable to shipping of crude oil. The Iranian Shiite ideology of martyrdom has already taken 1,000,000 lives during the Iran / Iraq war and the hardline fundamentalist regime has taken countless iranian lives in, internal purges. The effect of a US attack would unite the country in favour of a new holy war, that would enable the regime to deploy countless millions of soldiers as cannon fodder against the new wider war. Therefore would the US have the stomach for US deaths on par with if not greater than that of Vietnam ? Attacking Iran is not the solution to the problem. The Price of Oil would likely rally to well beyond $80 and perhaps beyond $100. This would put a strain on already weakening western economies and raise the specter of stagflation, leading to higher interest rates and a resulting recession during 2008. The financial markets would panic on the attack, with especially heavy selling of dollar assets, and hurry the process along towards a recession in early 2008. The Market Oracle Opinion Poll : Should the US Attack Iran's nuclear and military infrastructure? YES - Iran should be attacked and its nuclear facilities destroyed. NO - Iran's nuclear infrastructure should be dismantled via negotiations. Click Here for results so far - Final Results and analysis will be published on 18th April 2007. 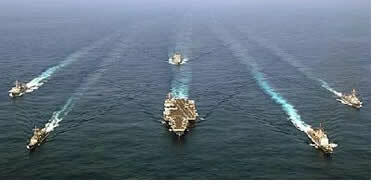 12 Apr 07, 04:55 Re: Vote Now - Should the US Attack Iran's nuclear and military infrastructure? 1. Yes and No in this poll are not opposites. Both "choices" take is for granted that we all agree that it is necessary to dismantle Iran's nuclear power industry. 2. Asking human beings to vote whether or not to attack and slaughter the innocent people of another nation is an outrageous invitation to immorality. The Market Oracle editors might benefit from a look at some children and then a look in the mirror. Sure, it's fine for a business publication to focus on economic consequences, but it's going too far to imply that a crime against international law is a perfectly normal "option." EDITOR COMMENT - Deleted with SPAM purge which occurs every hour or so. 12 Apr 07, 11:11 Re: Vote Now - Should the US Attack Iran's nuclear and military infrastructure? Of course the US is going to attack Iran, they stopped selling the US oil. In American eyes thats major blackmail and a threat to its national security. Alot of people don't get the extent of that. That's alot of power Iran is wielding and they need to grow up and be a big boy if they want nuclear power like the rest of the big boys who have nuclear power. 12 Apr 07, 18:49 Re: Vote Now - Should the US Attack Iran's nuclear and military infrastructure? The context of the poll is the build up to an attack against Iran as a consquence of its nuclear program. The point is that one way or another its nuclear weapons programme will be dismantled.